The BlueSkyBlue BRAVO style Ultimate Flying Suit is a 4 layer garment designed for use in cold weather. Typically, this suit is perfect for use in open cockpit microlights at altitudes of up to 10000 feet. 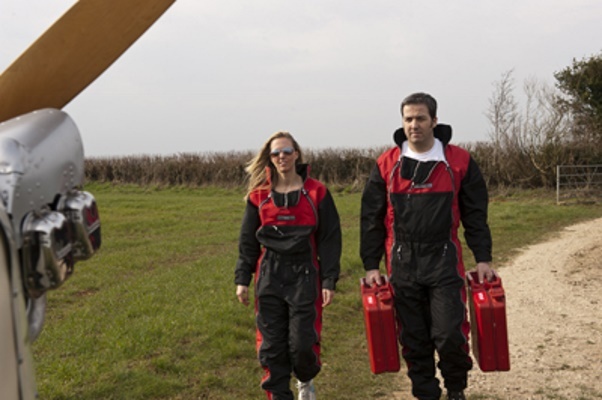 Many high altitude paraglider pilots and other leisure aviation pilots also find this top of the range suit to be ideal. 1) The outer fabric is called TASLAN� which is windproof and has a great soft feel for comfort. It is very durable and is coated in PU (polyurethane) to resist water. 4) The suit lining is black POLYESTER which is dyed using only azo free materials in the production process.